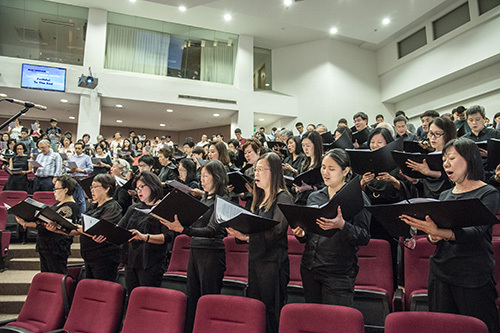 Beautiful strains of music filled the auditorium in Kum Yan Methodist Church as the Methodist Festival Orchestra and Methodist Festival Choir led the congregation in worship at the annual Aldersgate Service on 24 May 2016, rounding off four days of lectures, panel discussions and a Worship Festival. From left: GC-WSCS President, TRAC President, ETAC President, CAC President, and Bishop during worship at the Aldersgate Service. 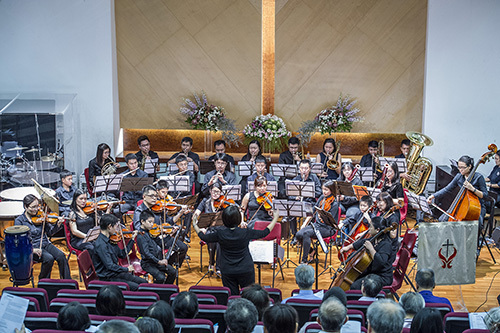 The Methodist Festival Orchestra performs at major Methodist events such as Aldersgate SG. “The Aldersgate Conference is a special occasion where Methodists from the three [annual] conferences come together to worship God and remember His work through the Methodist movement. As we sang our hearts out to God, and prayed in unison, such unity left a deep impression in me. It is important for us to have kingdom mindset. 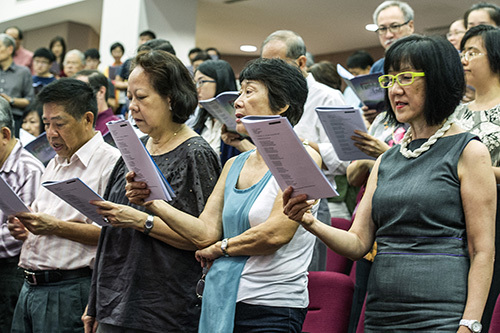 We are not divided by conferences or [the] church that we belong to or serve in,” said Ms Angela Lee of Ang Mo Kio Chinese Methodist Church, who attended the Aldersgate Service. 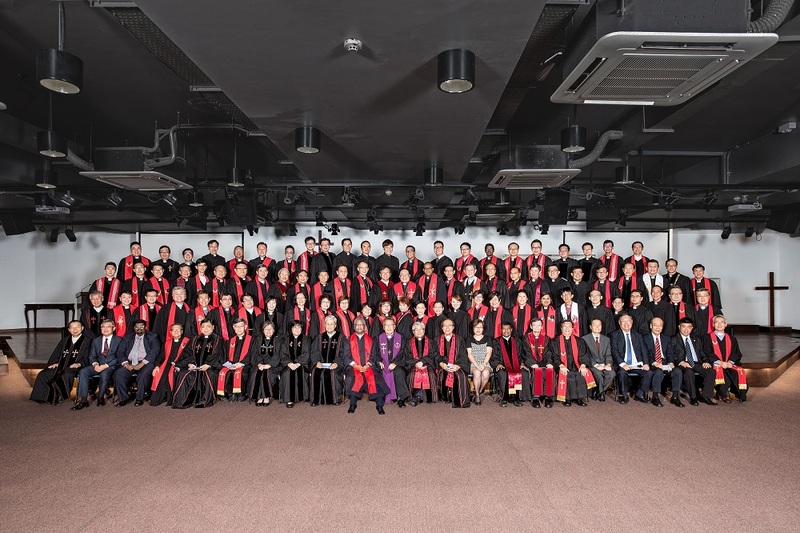 A Long Service Award was presented to the Rev Daniel Lee Kuan Yong, who reached 25 years of service in 2016. 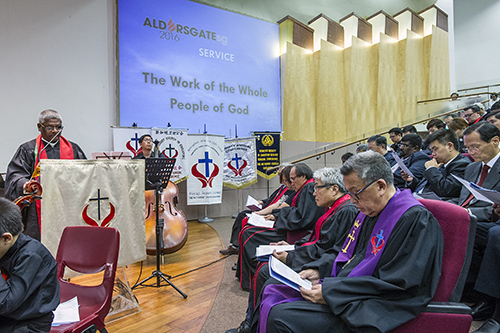 Through the Word, prayers, music, hymn texts and readings of pastoral reflections taken from the Rev Dr Gordon Wong’s book Faithful to the End: The Message of Daniel for Life in the Real World, this year’s Worship Festival sought to inspire and encourage people to find God in their daily work and to live lives with joyful hearts. Bishop Dr Wee Boon Hup bringing greetings and leading in the prayer for illumination at the Worship Festival. ETAC President Rev R. Prabhu leading in the prayer of confession and pardon at the Aldersgate Service. 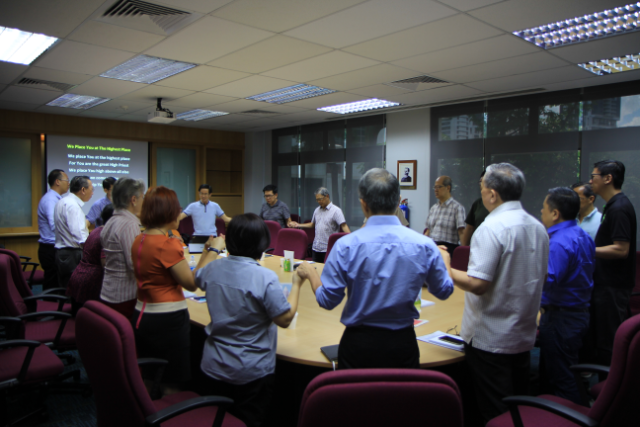 On the first day of lectures, 22 May, Bishop Dr Wee Boon Hup expounded on the biblical perspective of work. Debunking the prevalent misconception of religious work being more “spiritual” than work in the marketplace, he said that the Bible shows the dignity of all kinds of work. Firstly, work is intrinsic to God’s nature – He worked (Genesis 2:2). 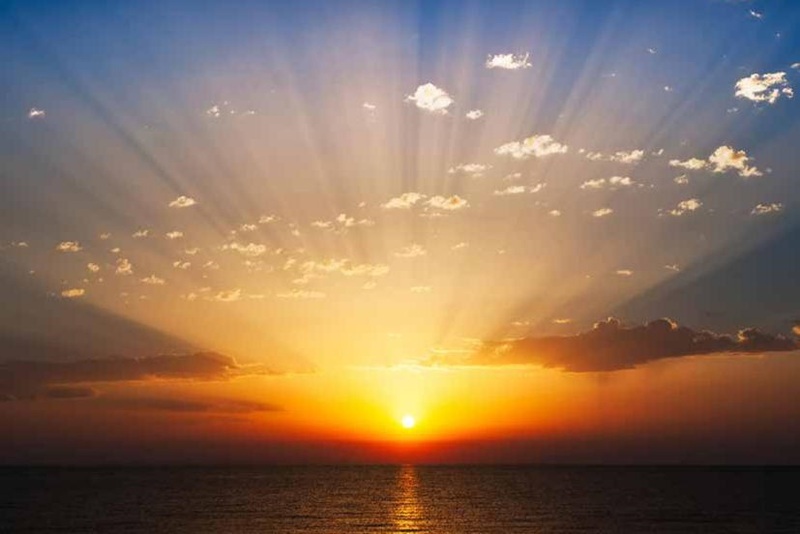 Creation was God’s work, and as with all creative work, required thinking, planning, evaluating and choosing, before bringing it into existence. He continues to work to re-create us in His image through His Son Jesus Christ, and rescue the rest of His creation till Christ’s second coming. Secondly, work is integral to our humanity, as He has entrusted to us stewardship over all He created (Genesis 2:15). Jesus did more than redeeming and affirming work in the New Testament when He came as a carpenter and not as a conquering general. 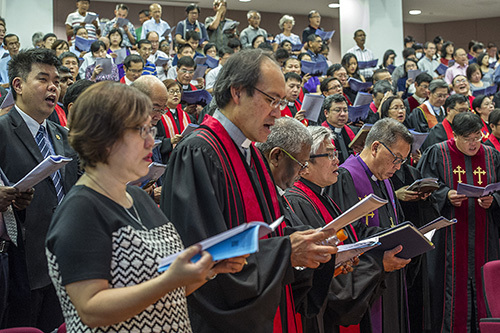 On the cross, He dealt with what caused work to be a curse – sin that motivates us to work for, protect, enhance and promote ourselves, said Bishop Dr Wee. He also pointed to the New Testament work ethic summarised in Colossians 3:17 – whatever we do, whether in word or deed, to do it all in the name of the Lord Jesus. Thirdly, work is indispensable to the rest of humanity, as we all depend on one another’s work. He urged us to “think about how our work impacts the environment and the ecology of the physical space we live in”. 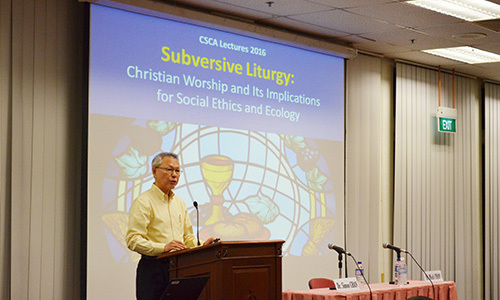 In his second lecture, Bishop Dr Wee preached about how good works – fruits of repentance – are essential as evidence of holiness of heart and life. Also, according to John Wesley’s economic ethics, our work is a matter of stewardship as earning money allows us to provide for ourselves and our families, care for those in need and accomplish God’s purpose on earth. As Wesley exhorted, to “gain all you can, save all you can, and give all you can”. “It was a timely reminder of the crucial role that many of us Methodists play outside Sundays. 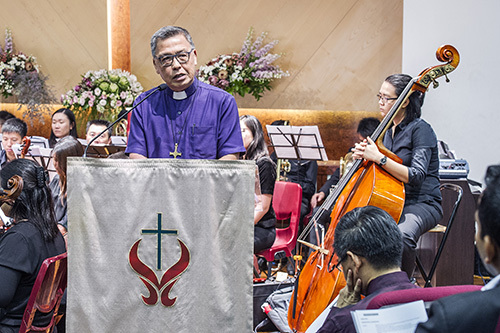 Bishop Dr Wee’s message on the Biblical perspective on why our work matters, highlighted why what we do on Mondays to Fridays is also our calling and ministry too,” said Mr Wong Neng Yang of Foochow Methodist Church. What have you found to be the most challenging issue you have faced in the marketplace because you are a Christian? Aligning two or three competing objectives – what God desires to do in a particular workplace, standards of morality, and profit. Managing self, and expectations people have of Christian bosses to exercise grace and forgiveness, yet also discipline and fair judgment in managing subordinates. If my role in the marketplace is on driving sales and profits, how does that honour God and would God take an interest in this role? Companies need to be profitable to be sustainable, but with spiritual discernment and our conscience, we need to consider the total costs of building our companies, whether it is at the expense of staff sacrificing family time, and compromising our values. How would you advise millennials who desire work to be purposeful and meaningful and would quit if they do not find work to be purposeful to them? Prioritise building your CV and picking up skills over seeking work-life balance right from the start. Managers have the duty to explain to their employees the organisation’s raison d’etre, and how their employees’ tasks fit into the bigger picture and the organisation’s objectives. 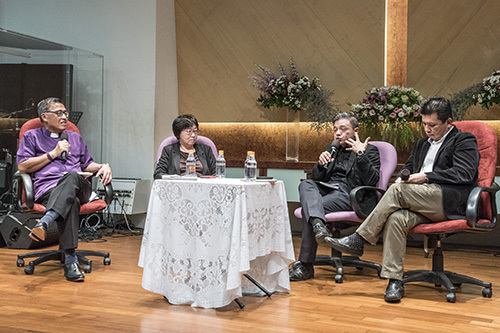 Bishop (far left) and panellists Ms Serene Wee, Mr David Ang and Mr Henry Tan in a discussion. With the demands of church ministry and of our paid work, how do you weigh how much to invest in church ministry at any given point in time? As a believer, the guiding principle would be Matthew 6:33 – to seek first His kingdom and His righteousness, and all these things will be given to you as well. 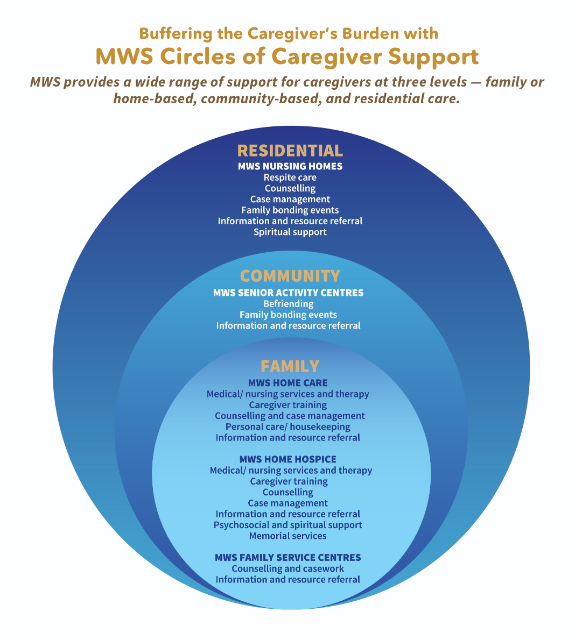 Thus arises the need to prioritise career and ministry demands. There will always be competing demands and pursuits but ultimately, the answer to that question rests on your personal conviction. Should we be seeking career advancement in our work? Is it wrong to be seeking to push yourself to rise in your profession? Aspiring for higher office and greater career opportunities is not wrong if we prove ourselves professionally and ethically. As stewards of our talents, we should do our best, and it is true that we are better poised to exert our sphere of influence when we are at the upper end of the corporate ladder. At the same time, apply the spirit of achieving excellence equally to church ministry as well. With commitment and compassion, you will be rewarded in more ways than one. I’m at a point in my life where I’m wondering where to go, what to do – something has died within me, I’m lost. Has any one of you ever experienced something like this? How did you handle or overcome it? This appears to describe a burnout. When you’ve been in a job for far too long, and have not been able to refresh yourself, gain new insights, and develop yourself further in learning, and feel jaded, you feel that every additional day at work is a struggle and a pain. Take a break to reflect on your work journey, and consider enlisting the help of a retreat master to clarify your issues before charting your next course of action. Office politics and other challenges common in the marketplace often make believers consider whether to quit or stay on, and why God has placed them there. How can a Christian make a godly decision in these challenges? In positions of influence, we should conduct ourselves such that we minimise the bad effects of politics and create an environment of trust and transparency. For example, be open and say that you do not wish to get involved. Being created and wired differently, we use different ways to achieve the same ends. Try to understand where someone is coming from, and learn to be “wise as serpents and innocent as doves”. 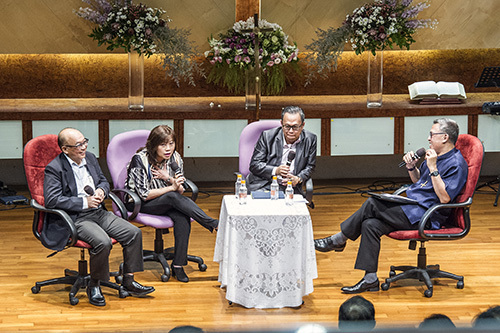 The panellists Prof Lionel Lee (left), Mrs Joni Ong, Dr Tan Tee Khoon and Bishop.